Media of the United States consists of television, radio, cinema, newspapers, magazines, and Internet-based Web sites. Many media are controlled by large for-profit corporations that reap revenue from advertising, subscriptions and sale of copyrighted material. Critics allege that local news, media spending and coverage have suffered as a result of media concentration. A media conglomerate, media group or media institution is a company that owns large numbers of companies in various mass media. Advertising regulation refers to the laws and rules defining the ways products can be advertised in a particular region. These rules can define a number of different aspects, including placement, timing and content. regulation: A law or administrative rule, issued by an organization, used to guide or prescribe the conduct of members of that organization; can specifically refer to acts in which a government or state body limits the behavior of businesses. advertising regulation: The laws and rules defining ways products can be advertised in a particular region. media conglomerate: A company that owns large numbers of companies in various mass media including television, radio and publishing. Media conglomerates strive for policies that facilitate control of markets across the globe. Media of the United States consists of television, radio, cinema, newspapers, magazines, and Internet-based Web sites. The U.S. also has a strong music industry. Many of the media are controlled by large for-profit corporations that reap revenue from advertising, subscriptions and sale of copyrighted material. American media conglomerates tend to be leading global players, generating large revenues as well as large opposition. Further deregulation and convergence is under way, leading to concentration of media ownership and the emergence of multinational media conglomerates. Critics allege that local news, media spending and coverage have suffered as a result of media concentration. A media conglomerate is a company that owns large numbers of companies in various mass media including television, radio and publishing. Media conglomerates strive for policies that facilitate control of markets across the globe. According to the 2012 Fortune 500 list, The Walt Disney Company is America’s largest media conglomerate in terms of revenue. News Corporation, Time Warner, Viacom and CBS Corporation round out the top 5. Other major players are NBCUniversal and Sony Corporation of America. Advertising regulation refers to the laws and rules defining ways products can be advertised in a particular region. These rules can define a wide number of different aspects, including placement, timing and content. 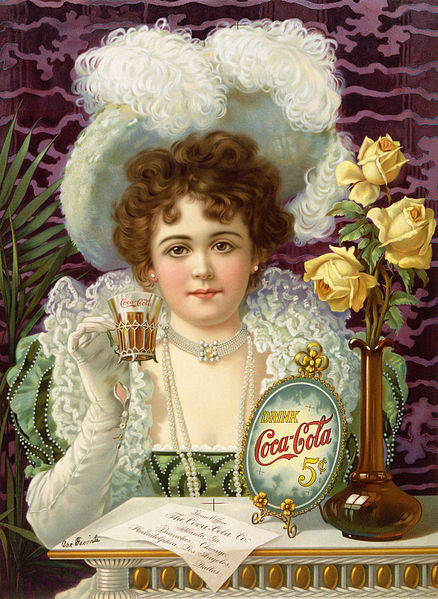 There are increasing efforts to regulate the content and influence of advertising. For example, the complete ban of advertising to children under 12 imposed by the Swedish government in 1991. Though that regulation continues for broadcasts originating within the country, it has been weakened by the European Court of Justice, which found that Sweden was obliged to accept foreign programming. Greece’s regulations are of a similar nature, “banning advertisements for children’s toys between 7 am and 10 pm and a total ban on advertisement for war toys. ” In the US, many communities believe that certain types of outdoor advertising blight the public realm. During the 1960s, there were attempts to ban billboard advertising in the open countryside. Journalism ethics and standards describe the principles of ethics and good practice journalists adopt in response to specific challenges. Codes of journalism are designed to guide journalists through numerous ethical challenges, such as conflict of interest. A conflict of interest occurs when a single individual or organization adopts multiple interests, one of which could potentially corrupt the incentive to pursue another. According to the accuracy and standards for factual reporting, reporters are expected to be as accurate as possible given the time allotted and the space available, and to seek only reliable sources. In addition, events with a single eyewitness are to be reported with attribution. Independent fact-checking by another employee of the publisher is desirable. A fact checker is the person who checks factual assertions in non-fictional text (usually intended for publication in a periodical) to determine their veracity and correctness. Harm limitation addresses the question of whether all information gathered should be reported, and if so, how. This principle of limitation creates a practical and ethical dilemma by acknowledging that some attention must be given to the negative consequences of full disclosure. News style is the prose style used for news reporting in media such as newspapers, radio and television. News writing attempts to answer every basic question about a particular event– who, what, when, where, why, and often how– at the opening of the article. This method of composition is sometimes called the “inverted pyramid”. journalism ethics and standards: Journalism ethics and standards describe the principles of ethics and good practice journalists adopt in response to specific challenges. fact checker: A fact checker is the person who checks factual assertions in non-fictional text (usually intended for publication in a periodical) to determine their veracity and correctness. The job requires general, wide-ranging knowledge and the ability to conduct quick and accurate research. conflict of interest: A situation in which someone in a position of trust, such as a lawyer, insurance adjuster, a politician, executive or director of a corporation or a medical research scientist or physician, has competing professional or personal interests. Journalism ethics and standards describe the principles of ethics and good practice journalists adopt in response to specific challenges. Historically and currently, journalists consider the subset of media ethics as their professional “code of ethics” or “canons of journalism”. 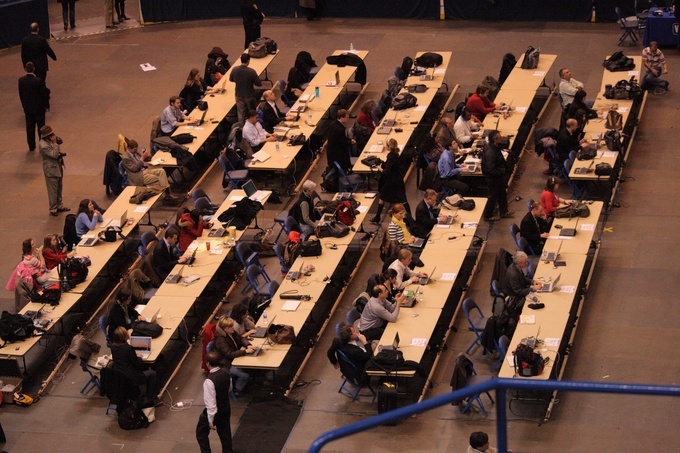 These basic codes and canons commonly appear in statements drafted by professional journalism associations and individual print, broadcast, and online news organizations. While various existing codes have some differences, most share common elements: notably, the principles of truthfulness, accuracy, objectivity, impartiality, fairness and public accountability as they apply to the acquisition of newsworthy information and its subsequent dissemination to the public. Codes of journalism are designed to guide journalists through numerous ethical challenges, such as conflict of interest. The codes and canons provide journalists with a framework for self-monitoring and self-correction. A conflict of interest occurs when a single individual or organization adopts multiple interests, one of which could potentially corrupt the incentive to pursue another. The United States and Europe have typically been considered pioneers in the formulation and adoption of these standards, though similar codes can be found in nearly any country that enjoys freedom of the press. While the written codes and practical standards of journalism vary somewhat from country to country and organization to organization, they tend to overlap substantially between mainstream publications and societies. In accordance with the accuracy and standards for factual reporting, reporters are expected to be as accurate as possible given the time allotted and the space available for story preparation, and to seek only reliable sources. In addition, events with a single eyewitness are to be reported with attribution. Events with two or more independent eyewitnesses may be reported as facts. Controversial facts are reported with attribution. Moreover, independent fact-checking by another employee of the publisher is desirable. A fact checker is the person who checks factual assertions in non-fictional text (usually intended for publication in a periodical) to determine their veracity and correctness. The job requires general, wide-ranging knowledge and the ability to conduct quick and accurate research. According to the Columbia Journalism Review, the German weekly Der Spiegel runs “most likely the world’s largest fact checking operation,” employing the equivalent of eighty full-time fact checkers as of 2010. During the normal course of an assignment, a reporter might go about a variety of tasks– gathering facts and details, conducting interviews, doing research, background checks, taking photos, videotaping, recording sound. Harm limitation addresses the question of whether all information gathered should be reported, and if so, how. This principle of limitation creates a practical and ethical dilemma by acknowledging that some attention must be given to the negative consequences of full disclosure. Ethical standards should not be confused with the common standards of quality of presentation. News style is the prose style used for news reporting in media such as newspapers, radio and television. News style requires not only a unique vocabulary and sentence structure, but also a particular manner of presentation– the situational importance of tone and intended audience, for instance. News writing attempts to answer every basic question about a particular event– who, what, when, where, why and often how– at the opening of the article. This method of composition is sometimes called the “inverted pyramid”, named for the decreasing importance of information in subsequent paragraphs. Inverted Pyramid: The Inverted Pyramid. This story can be trimmed from the bottom without losing important details. A regulation is a legal provision that creates, limits, or constrains a right, creates or limits a duty, or allocates a responsibility. One can consider regulation as actions of conduct imposing sanctions, such as a fine, to the extent permitted by the law of the land. FCC works towards six goals in the areas of broadband, competition, the spectrum, the media, public safety, and homeland security. With the major demographic shifts occurring in the country in terms of the racial-ethnic composition of the population, the FCC has also been criticized for ignoring the issue of decreasing racial-ethnic diversity of the media. Network Neutrality in the United States is a hotly debated issue subject to regulatory and judicial contention among network users and access providers. network neutrality: A principle proposed for user-access networks participating in the Internet that advocates no restrictions by ISPs or government on the content, sites, platforms, equipment, and modes of communication over the network. federal communications commission: The Federal Communications Commission (FCC) is an independent regulatory agency of the United States government created by Congressional statute, with the majority of its commissioners appointed by the current president. A regulation is a legal provision that creates, limits, or constrains a right, creates or limits a duty, or allocates a responsibility. Regulation can take many forms: legal restrictions promulgated by a government authority, contractual obligations that bind many parties, self-regulation by an industry such as through a trade association, social regulation, co-regulation, or market regulation. One can consider regulation as actions of conduct imposing sanctions, such as a fine, to the extent permitted by the law of the land. The Federal Communications Commission (FCC) is an independent agency of the United States government. FCC works towards six goals in the areas of broadband, competition, the spectrum, the media, public safety, and homeland security. The Commission is also in the process of modernizing itself. The inauguration of Ronald Reagan as President of the United States in 1981 accelerated an already ongoing shift in the FCC towards a decidedly more market-oriented stance. A number of regulations felt to be outdated were removed, most controversially the Fairness Doctrine in 1987. The FCC also took steps to increase competition to broadcasters, fostering broadcast alternatives such as cable television. In terms of indecency fines, there was no action taken by the FCC from FCC v. Pacifica until 1987, about 10 years later. FCC Logo: An additional logo of the FCC. The FCC’s mission is to create a purpose for national defense ad for the purpose of promoting safety of life and property through the use of wire and radio communications. In the early 2000’s (decade), the FCC began stepping up censorship and enforcement of indecency regulations again, most notably following the Janet Jackson “wardrobe malfunction” that occurred during the halftime show of Super Bowl XXXVIII. However, the FCC’s regulatory domain with respect to indecency remains restricted to the public airwaves, notably VHF and UHF television and AM/FM radio. In other words, the FCC has a strong role in regulating public airwaves. Press Coverage and film Crew at Barack Obama rally 2008: Media photographers and video crews, documenting the events onstage at a Barack Obama rally in Hartford, Connecticut. With the major demographic shifts occurring in the country in terms of the racial-ethnic composition of the population, the FCC has also been criticized for ignoring the issue of decreasing racial-ethnic diversity of the media. This includes charges that the FCC has been watering down the limited affirmative action regulations it had on the books, including no longer requiring stations to make public their data on their minority staffing and hiring. In the second half of 2006, groups such as the National Hispanic Media Coalition, the National Latino Media Council, the National Association of Hispanic Journalists, the National Institute for Latino Policy, the League of United Latin American Citizens (LULAC), and others held town hall meetings in California, New York, and Texas on media diversity as its effects Latinos and minority communities. They documented widespread and deeply felt community concerns about the negative effects of media concentration and consolidation on racial-ethnic diversity in staffing and programming. At these Latino town hall meetings, the issue of the FCC’s lax monitoring of obscene and pornographic material in Spanish-language radio and the lack of racial and national-origin diversity among Latino staff in Spanish-language television were other major themes. Network Neutrality in the United States is a hotly debated issue subject to regulatory and judicial contention among network users and access providers. As a de facto matter, there is a degree of network neutrality in the United States, meaning that telecommunications companies rarely offer different rates to broadband and dial-up Internet consumers based on Internet-based content or service type. However, there are no clear legal restrictions against these practices. Broadband providers often block common service ports, such as port 25 (SMTP) or port 80 (HTTP), preventing consumers (and botnets) from hosting web and email servers unless they upgrade to a “business” account. In recent years, advocates of network neutrality have sought to restrict such changes. In 2005 and 2006, corporations supporting both sides of the issue spent large amounts of money lobbying Congress. In 2006, representatives from several major U.S. corporations and the federal government publicly addressed U.S. Internet services in terms of the nature of free market forces, the public interest, the physical and software infrastructure of the Internet, and new high-bandwidth technologies. The Federal Communications Commission (FCC) is an independent regulatory agency of the United States government. In 1934, Congress passed the Communications Act, which abolished the Federal Radio Commission and transferred jurisdiction over radio licensing to a new Federal Communications Commission. In the early 2000s, the FCC stepped up enforcement of indecency regulations, most notably following the Janet Jackson “wardrobe malfunction” that occurred during the halftime show of Super Bowl XXXVIII. The FCC is directed by five commissioners appointed by the president, who designates one of the commissioners to serve as chairman. The FCC regulates broadcast stations, amateur radio operators and repeater stations as well as commercial broadcasting operators. Broadcast licenses are to be renewed if the station meets the “public interest, convenience, or necessity”. communications act: The Communications Act abolished the Federal Radio Commission and transferred jurisdiction over radio licensing to a new Federal Communications Commission. The Federal Communications Commission (FCC) is an independent regulatory agency of the United States government created by Congressional statute, with the majority of its commissioners appointed by the current president. FCC Seal: Seal of the United States Federal Communications Commission. The FCC took over wire communication regulation from the Interstate Commerce Commission. The FCC’s mandated jurisdiction covers the 50 states, the District of Columbia and U.S. possessions. The FCC also provides varied degrees of cooperation, oversight and leadership for similar communications bodies in other countries of North America. The FCC is funded entirely by regulatory fees. It has an estimated fiscal-2011 budget of 354.2 million and 1,898 federal employees. In 1934, Congress passed the Communications Act abolishing the Federal Radio Commission and transferring jurisdiction over radio licensing to a new Federal Communications Commission. Title II of the Communications Act focused on telecommunications using many concepts borrowed from railroad legislation and Title III contained provisions very similar to the Radio Act of 1927. 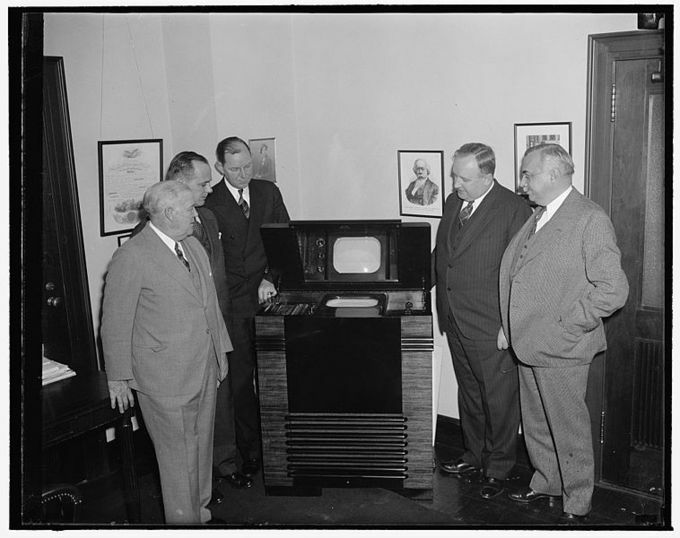 FCC Commissioners inspect the latest in television (1939). : The Federal Communications Commission (FCC) has promised to ensure fairness in broadcasting. In 1996, Congress enacted the Telecommunications Act of 1996. The legislation attempted to create more competition in local telephone service by requiring Incumbent Local Exchange Carriers to provide access to their facilities for Competitive Local Exchange Carriers. This policy has had limited success. The development of the Internet, cable services and wireless services has raised questions whether new legislative initiatives are needed. Congress has monitored developments, but as of 2009 has not undertaken a major revision of the regulation. In the early 2000s, the FCC once again stepped up enforcement of indecency regulations, most notably following the Janet Jackson “wardrobe malfunction” that occurred during the halftime show of Super Bowl XXXVIII. However, the FCC’s regulatory domain with respect to indecency remains restricted to the public airwaves, notably VHF and UHF television and AM/FM radio. The FCC is directed by five commissioners appointed by the president. The president designates one of the commissioners to serve as chairman. Only three commissioners may be members of the same political party. None may have a financial interest in any FCC-related business. The Consumer & Governmental Affairs Bureau (CGB) develops and implements the FCC’s consumer policies, including disability access; The Enforcement Bureau (EB) is responsible for enforcement of provisions of the Communications Act of 1934, along with FCC rules, orders and conditions of station authorizations; The International Bureau (IB) develops international policies in telecommunications like coordination of frequency allocation; The Media Bureau (MB) develops, recommends and administers the policy and licensing programs relating to electronic media, including cable television, broadcast television, and radio in the United States and its territories; The Wireless Telecommunications Service (WCS) deals with Advanced Wireless Services (AWS) and fixed, mobile, and broadcast services on the 700 MHz Band; The Wireline Competition Bureau (WCB) develops policy concerning wireline telecommunications. The FCC’s enforcement powers include fines and broadcast license revocation. Burden of proof would be on the complainant in a petition to deny. Fewer than 1% of station renewals are not immediately granted, and only a small fraction of those are ultimately denied. While the FCC maintains control of the written and Morse testing standards, it no longer administers the exams, having delegated that function to private organizations.